Despite recent work on behalf of Telford and Wrekin Council to stabilise the banks of the Ironbridge Gorge around Jackfield the Gorge area is still a geologically unstable area. There is a real risk that at some point in the future there will be a landslide which will block the River Severn and cause serious problems in and around the Gorge. 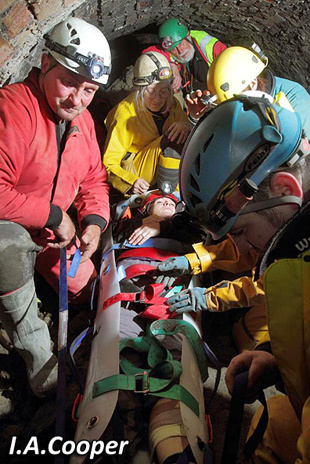 Should this happen then a Major incident would be declared and it is highly likely that support would be requested from Shropshire and Telford and Wrekin County Volunteers Emergency Committee – which includes Midlands Cave Rescue Organisation. 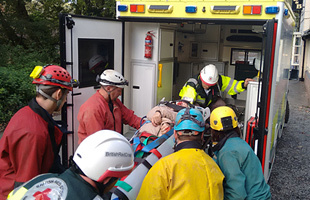 For the purpose of this exercise, it was assumed that the Blue Light Services were already fully deployed on different tasks in response to the emergency, so participating voluntary agencies (MCRO, West Mercia Search and Rescue, National Search And Rescue Dog Association, British Red Cross, RAYNET and Council Community Champions) were called upon to take part in a number of scenarios and activities. 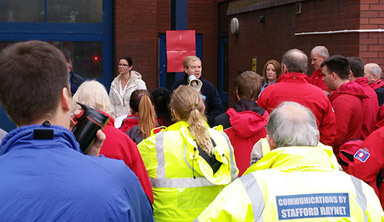 Above: Volunteers assemble at Telford Fire Station for an early morning briefing. The day kicked off with briefings for the volunteers involved, including the brave volunteer casualties from the 605 Auxiliary Squadron (Cosford) and Shropshire Fire and Rescue Swift Water Technicians. One of the key aims of the day was to practice communication paths and systems within an operational environment. 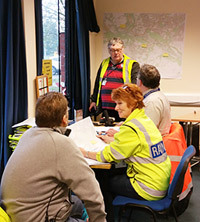 Key communications for the exercise were provided by RAYNET with operators at Telford Fire Station (Exercise Control) and at individual "Multi-Agency Bronze" control points in the Gorge. Above: Volunteer briefing and the RAYNET Control at Telford Fire Station. 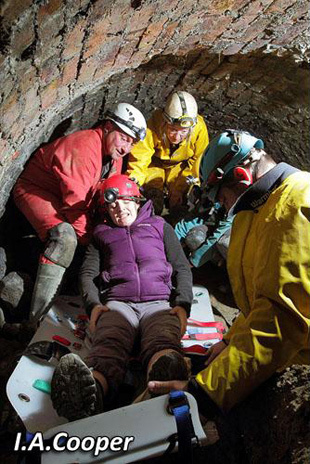 The first scenario presented to MCRO was the report of visitors to the Tar Tunnel failing to return from their underground visit following the landslide and power cuts. 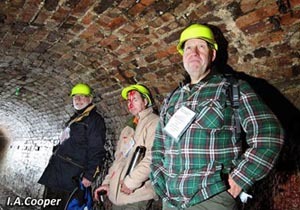 A team was dispatched to investigate and discovered a small roof fall at the tunnel entrance and 3 casualties inside. One of the casualties had tripped over one of the others when the lights went out and suffered a head injury and appeared to be suffering from concussion requiring a stretcher evacuation once the 'walking' wounded had been evacuated. 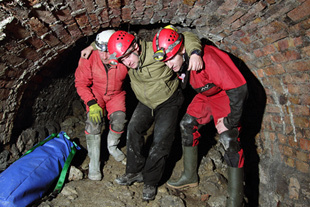 Above: The volunteer casualties from 605 Squadron (Cosford) preparing for the start of the tar Tunnel exercise and (right) the casualty with a head injury being tended to by the first team member on scene. 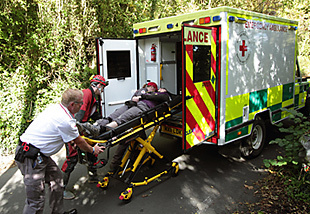 Above: Back on the surface - moving the stretcher casualty to the Red Cross ambulance. 2. Car in a "Sink hole"
While some team members were dealing with the first incident a second call was received by the team. This time assistance of a rope access team was requested to help occupants trapped in a car that has slide into a sink hole. They appeared uninjured but were not able to climb out of the hole. 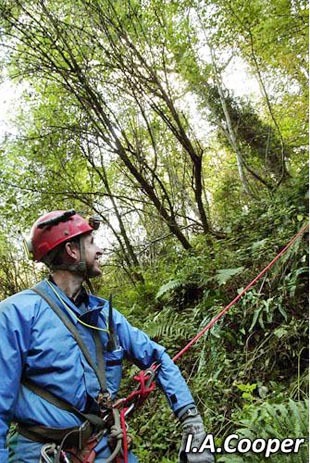 A team was duly sent to the scene with rigging kits and evac harness, plus a CasCare First Aider to assess them for injuries before attempting to haul them out. 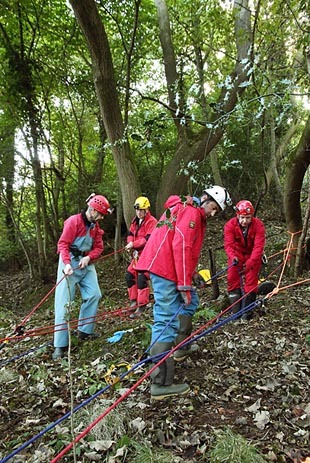 Above: MCRO rope access team preparing to haul casualties from a car stuck in a 'hole'. "A Council Community Champion reports that people who went to shelter in a tunnel, like their grandparents did during the war, have not been seen since, please ask Cave Rescue to investigate." A team was duly sent to the scene and 2 casualties located, one with a suspected broken ankle and lower leg injury from falling rocks, the other with a minor leg injury. The added complication was the casualties were in a collapse zone with a very narrow access slot. After initial first aid treatment they had to be helped through the slot, before one was helped out, while the other needed to be carried out in a stretcher. 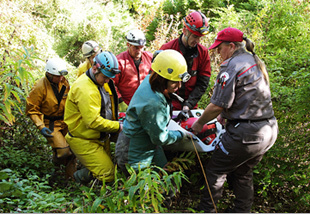 Above: Carefully placing the volunteer casualty with the lower leg injury into the SLIX Rescue stretcher. 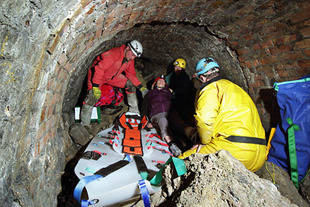 Above: Moving the stretcher casualty out of the tunnel and into the Red Cross ambulance. All scenarios were successfully completed and the communications provided by RAYNET worked well. The other volunteer organisations working on the river and searching the woods and hillsides of the Gorge also had a successful day. 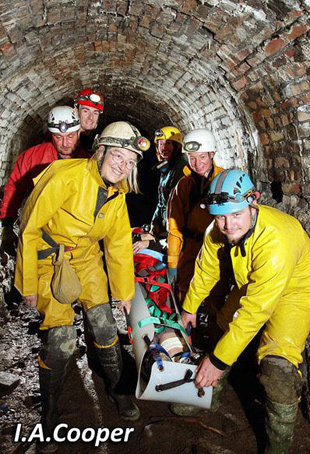 To the Ironbridge Gorge Museum Trust for allowing us to use the Tar Tunnel and to the landowners on both sides of the river for access to their land for the "Car" rescue and the other tunnel incident. Also thanks to RAYNET and the British Red Cross for their support on the day, Shropshire Fire and Rescue Service and the Civil Resilience teams of Shropshire, and Telford and Wrekin Councils, not forgetting all the MCRO Team members who took part. To the volunteer casualties from 605 Auxiliary Squadron (Cosford) who worked with us on the day - you all deserve Oscars & BAFTAs for your performances. All the team commented on how realistic your performances were! 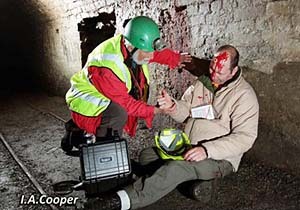 Shropshire Star: "Emergency! 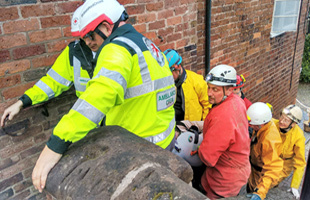 Teams gather for Ironbridge Gorge disaster"